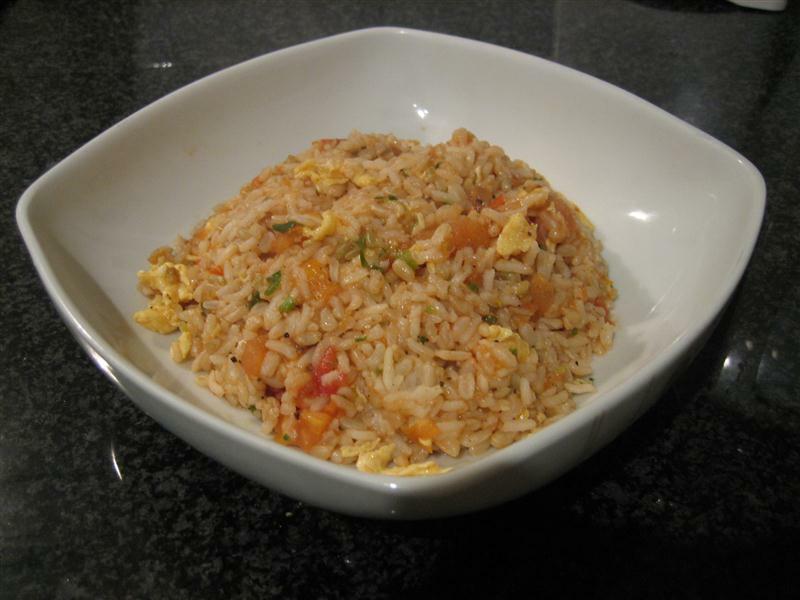 When it comes to cooking, I mainly look to fill my stomach in the quickest time possible – I ain’t getting all pro and fancy like some people :-) Especially when I come home after work tired and hungry, I prefer it quick and easy, like this recipe for tomato and egg fried rice. The good thing about this one is that instead of using tomato sauce like the version you’ll find in restaurants, this one uses real tomatoes, which helps in my quest to keep processed food out of my diet. Use 1 tbsp of the oil to fry the egg until it’s *just* cooked, then put it aside. Using the other tablespoon of oil, fry the minced spring onion on high heat for a few seconds, add the tomato, and continue frying for another minute or so. Add the rice and egg, separating the clumps so that everything is well mixed. Last, season with soy sauce and black pepper and continue to fry until the the rice is heated right through. If you find the taste too bland, you can throw in some chopped smoked ham, which goes very nicely. In the pictured version, I’ve used a 50-50 mix of white and brown rice. Brown rice is better for you, but it is harder to palette if you’re used to plain white rice. Do you know how long it’s been since I’ve had fried rice???! Looks great. Can you make that next time we come round? LOL. We can stretch it to twice by all means if you’re feeding us.